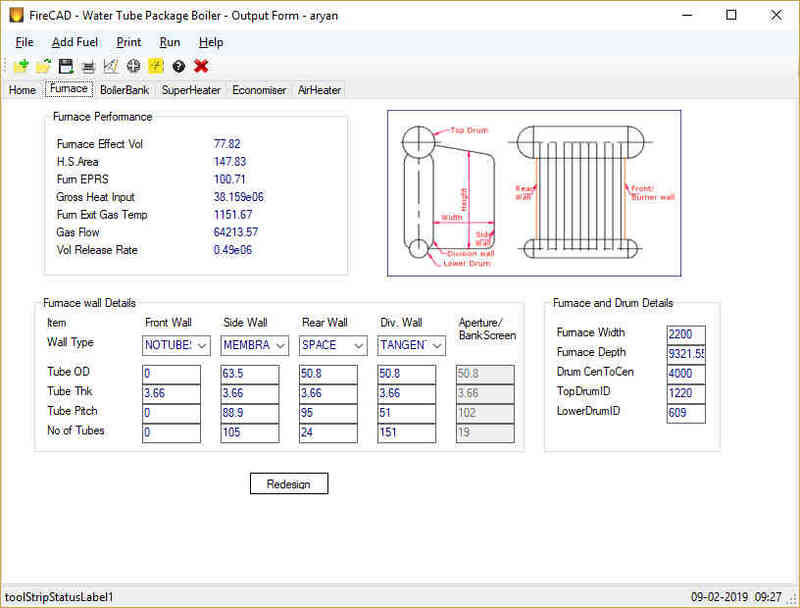 Water tube Package Boiler Design software of FireCAD series, is a simple yet powerful Software for designing Water tube Package Boilers. 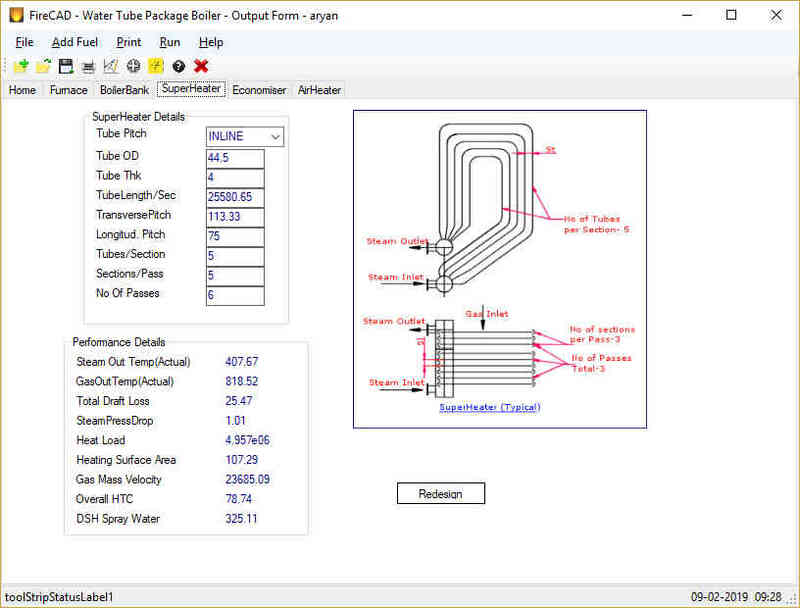 This package helps novice as well as expert design engineers for quick and accurate designs. 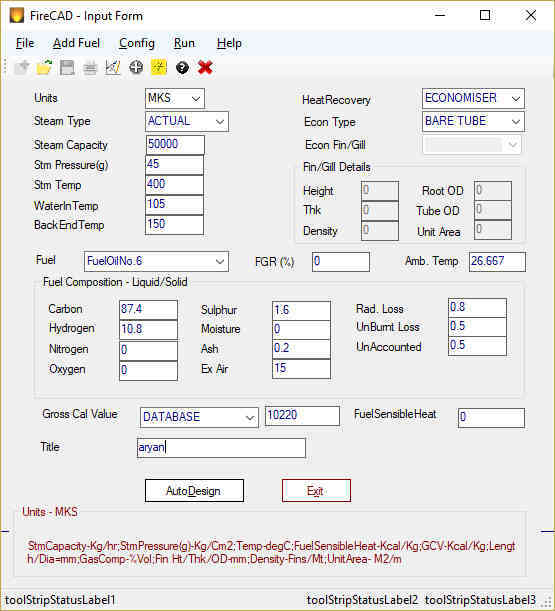 FireCAD comes with extensive database of Fuels. 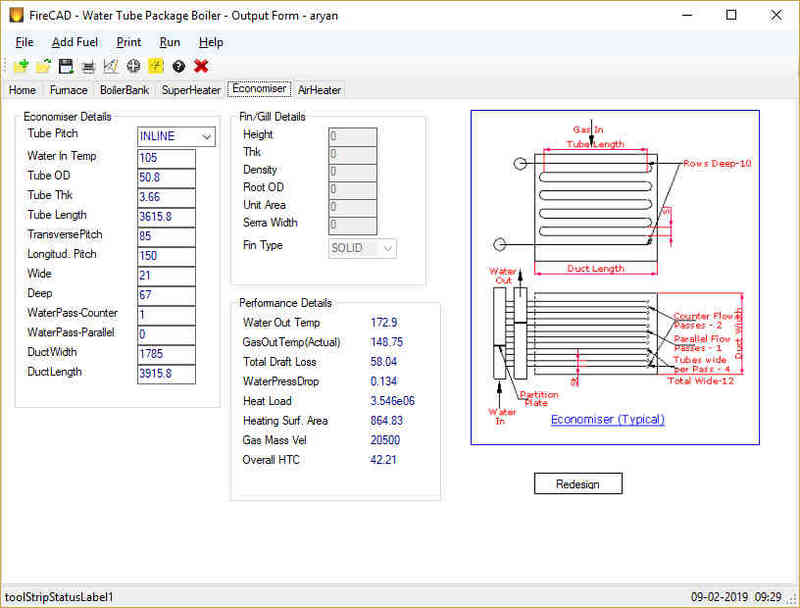 Both Oil Boilers and Gas Boilers can be designed. 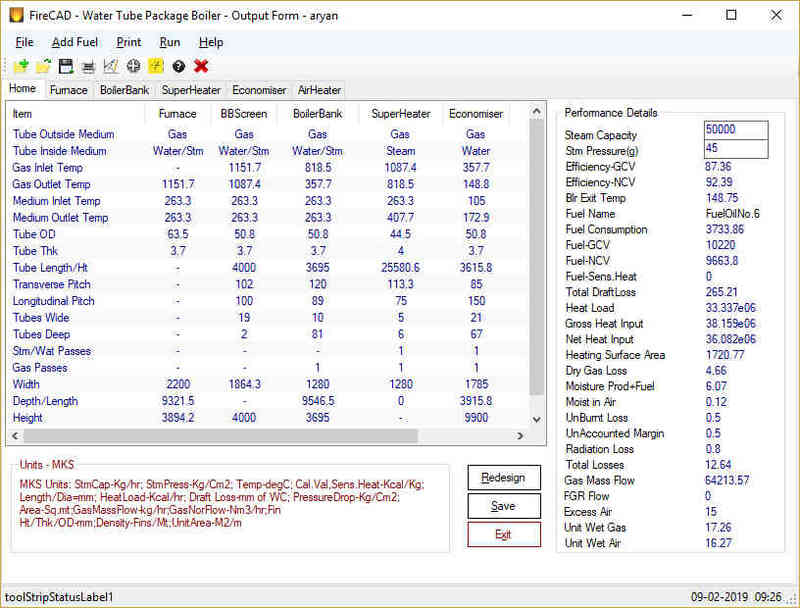 Complete system with SuperHeater, Economizer and AirHeater can be designed. Option to include Economizer with Bare/Fin/Gill tubes. 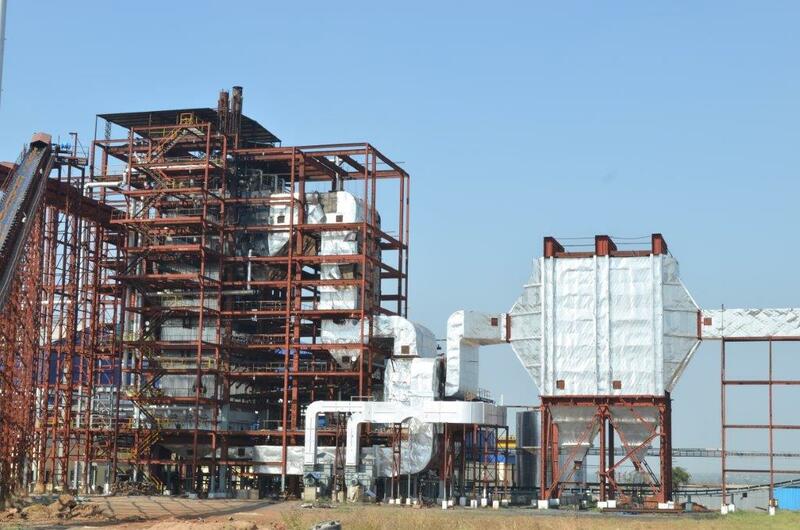 Flue Gas Recirculation (FGR) option is available. These are shop assembled and bi-drum boilers. Fuel is either oil or gas. Fuel is fired in the furnace with the help of burners. The boiler consists of furnace, bi-drum boiler bank and economizer and sometimes an air heater. There are several types of water tube package boilers based on shape of the boiler like , ‘D’ type, ‘O’ type , ‘A’ type etc. ‘D’ type boilers are most widely used. Furnace is usually membrane walled and gas tight. Most of the heat transfer occurs in the furnace in the form of direct radiation. ‘D’ type furnace is widely used compared to other configurations. Most of these boilers operate under positive pressure on gas side as there are provided only with FD fan and no ID fan. So leak proof casing is very much required to arrest gas leakage into boiler room. 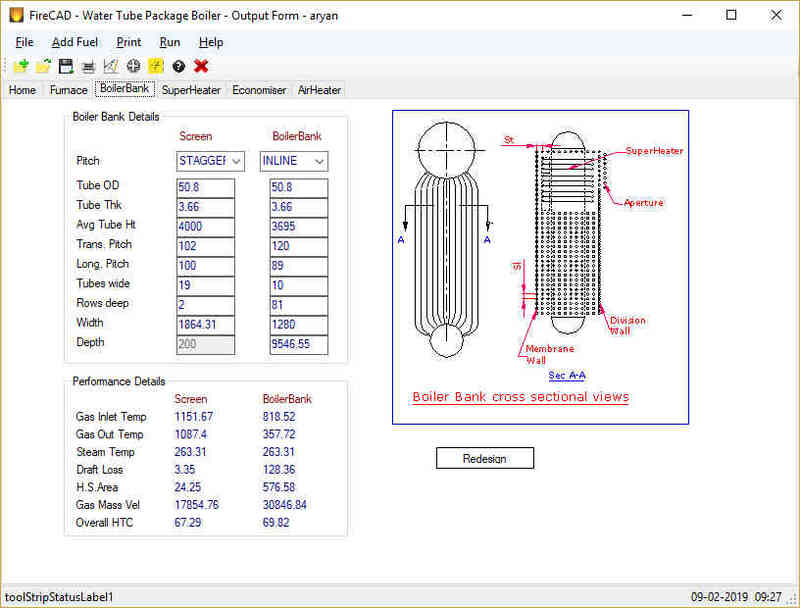 There are several types of superheaters employed in water tube package boilers. Inverted ‘U’ is most widely used. There are other types like vertical ‘S’ type drainable. Superheater is usually embedded in the boiler bank. When superheat temperature is high, part of the superheater section is directly place in the furnace to increase direct radiation and reduce size. Boiler bank connects both the drums. Natural circulation occurs with out the aid of any external downcomers. First 20-30% rows act as risers and the rest act as downcomers. Membrane division wall separates the boiler bank and the furnace. Drum coil heaters are provided in the lower drum to preheat the feed water before sending it to Economizer. Boiler parts include boiler sections like furnace,superheater,boiler bank,economizer,airheater, steam and water drums. Fuel firing equipment like oil burner,gas burner,ring main system, oil tanks and oil preheating equipment.